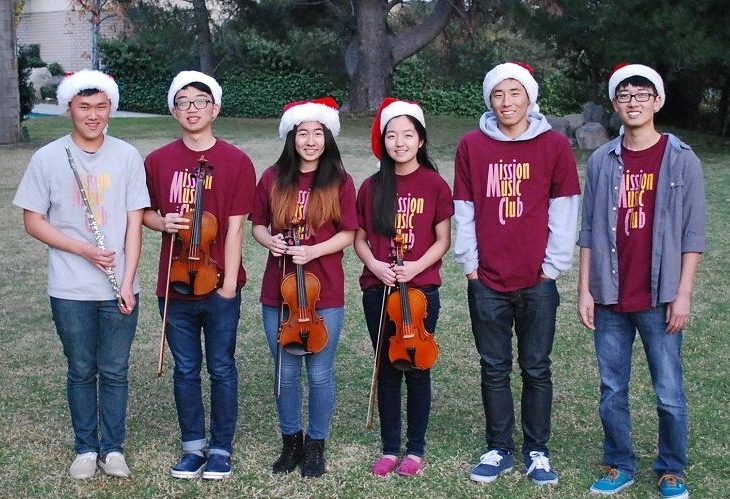 Robert Lee, second from left, and Mission Music Club members are making senior citizens happy this holiday season. A group of Korean American high school students are keeping senior citizens warm at heart with their music this holiday season. Their group is called the ‘Music Mission Club,’ and they’ve been performing in senior citizen centers and elderly care homes around Los Angeles and Orange County. Their club was first formed back in 2004, with high school students hailing mostly from La Crescenta and La Cañada. They currently have 15 members, who play instruments varying from violin and cello to clarinet and viola. However, the music they play is not very familiar to the performers, as they purposefully picked songs to play that their grandparents can identify with and enjoy. According to their conductor Kwon Hyang, club members gather to practice for at least two hours every Saturday. They are scheduled to perform in Los Angeles and Orange County facilities on December 24th, 26th, and 27th.